Can a private resort company own a lake? If so, are the fish in the lake private or public? And can the resort keep the public from fishing in that lake? These critical questions are central to a David vs. Goliath battle unfolding in BC’s Nicola Valley that could have huge implications for all British Columbians. And Bill 5, which has been introduced in the BC Legislature, raises concerns that the BC government might be about to side with the company. The broad outline of the story can be found in a recent piece by Mark Hume in the Globe and Mail: Little BC fishing club takes on U.S. billionaire. The dispute arose when members of the club protested against a ranch policy of locking gates on roads leading to Minnie and Stoney Lakes. The Douglas Lake Cattle Co. has developed those lakes as private sport-fishing destinations, building a lodge that charges $349 per night, plus $195 if you want a fishing guide. The [Nicola Valley Fish and Game] club claims a public road used to provide free access to Minnie and Stoney Lakes. 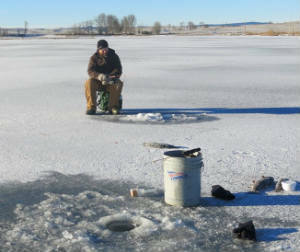 Fearing that if the Douglas Lake Cattle Co. gets away with locking them out of Minnie and Stoney, up to 20 other lakes could also be put off limits, club members climbed over the gate, walked out on the frozen lake and started fishing. They followed that up by filing a petition with the Supreme Court of B.C. seeking to have the gates unlocked. Now the Douglas Lake Cattle Co. has filed a civil claim against the club, alleging trespassing, claiming the trout as “domestic animals” and arguing “the public has no right to fish” on the lakes. But the Globe and Mail story does not really discuss what the case means for British Columbia’s environment or public ownership of fish and water - issues of much concern for many British Columbians. Who owns fish (and lakes)? In BC, there is a presumption that lakes are publicly owned – and in general that fish and wildlife cannot be privately owned, either. And it has been generally accepted that Minnie and Stoney Lakes were (are?) “public lakes,” and in fact the Province actually spent some years stocking these lakes with fish. But that was before Douglas Lake Cattle Company raised the levels of the lake, flooding their own private property, and took over stocking the lakes with fish for the convenience of their lodge’s guests. Now Douglas Lake Cattle Company claims that a portion of the beds of the lakes are private, and the fish that it released into the lakes are its own, private fish. They also claim that the public road that led right past the lakes has been closed, and that they have the right to lock it. The provincial government did little or nothing to assert the public’s right to use this road, or to fish in these lakes, until DLCC sued both the Nicola Valley Fish and Game Club and the Province. (DLCC had to sue the Province in hopes of getting a declaration that they privately own the various lakes, fish and roads.) The Province now agrees, in its Statement of Defence, that the road in question is public. Can a natural lake be privatized by “improving” the lake? Does the person who “owns” the bed of a lake control the right to navigate or fish on the lake? Are fish released into a lake still the property of the person who released them? The dispute over these two lakes is not unique. There are many other lakes that are surrounded by private land where this type of dispute has arisen. We think that the Nicola Valley Fish and Game Club has a solid case, and one which could provide an important precedent that may help all British Columbians. We’re proud to have provided them with a grant from our Environmental Dispute Resolution Fund. Another section of the Land Title Act – section 108(2) – could really help the Nicola Valley Fish and Game Club. It says (in somewhat convoluted language), that if a plan is filed with the Land Title Office that includes private lands covered by water adjacent to Crown lands, those private lands are transferred to the Crown (unless the Minister of Lands orders otherwise). Now, I don’t know if any such plans have been filed in respect of Stoney or Minnie Lakes, but if they have, the Act appears to confirm that the beds of the lakes are both publicly owned. it would be “inappropriate or unfair” for those lands to be owned by the Crown because a person had believed that the land was privately owned and had incurred costs or could incur future costs as a result of that belief. Notice the imbalance of these provisions – there is no requirement to consider the public’s belief that a water body is publicly owned, only the private owner’s belief. Given the timing of these amendments, we believe that this provision may be related to the DLCC court case, and could be used to declare that the lands flooded by DLCC are still privately owned. That would not, in our view, resolve the many legal issues in play, but it could undermine one argument that would otherwise be open to the Nicola Valley Fish and Game Club. We think that the Nicola Valley Fish and Game Club is right – public lakes are a provincial treasure and fish in those lakes cannot be privately owned. We wish them well in the court case, and are proud to have supported them to date. But we also think British Columbians expect their government to protect public rights to fish and public ownership of lakes. We hope that the BC government will step up to the plate and defend this lawsuit by DLCC vigorously, and not do anything that could undermine public ownership of these lakes. Photos from the Nicola Valley Fish and Game Club Facebook Page.